This is not crafty, just cute. 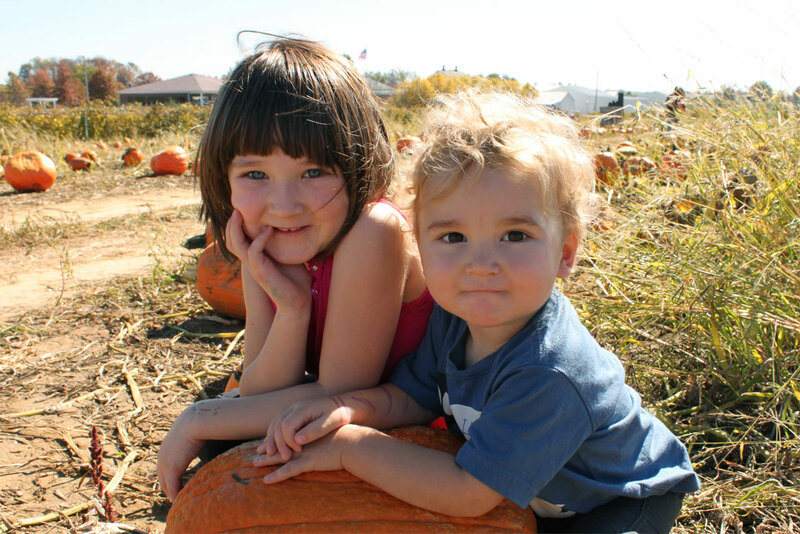 My sweet kiddos in a pumpkin patch yesterday. Worth wanted to take home every single pumpkin and Dorothy was primarily concerned with selecting a pumpkin for herself that was at least one obvious step up in size from her brother’s. 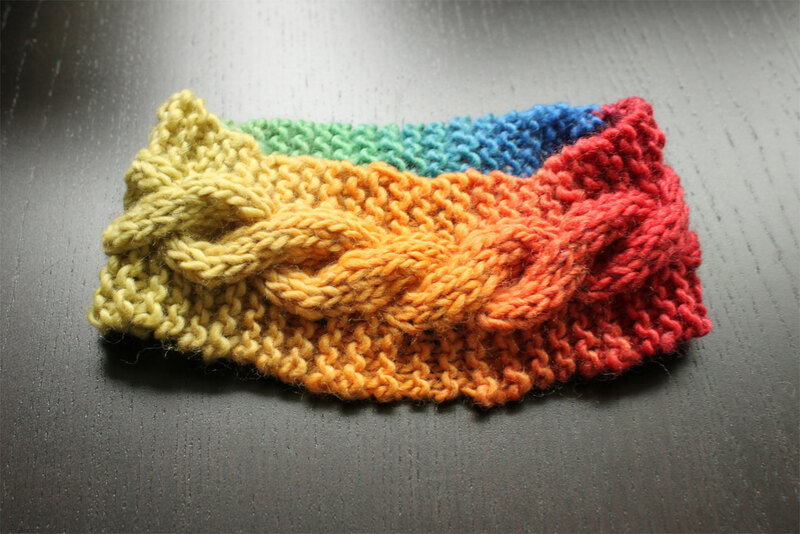 This is a headband/earwarmer thing I knooked for a friend’s daughter. The little girl loves wearing headbands so I was thinking that headband-like winterwear might make her a nice birthday gift. 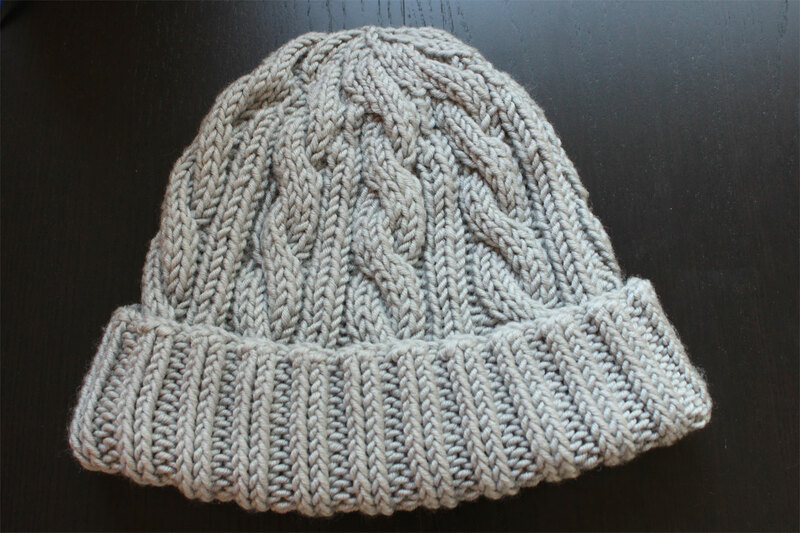 I used some of my leftover Chroma yarn from my recent hat project and this pattern, which was quick and easy. 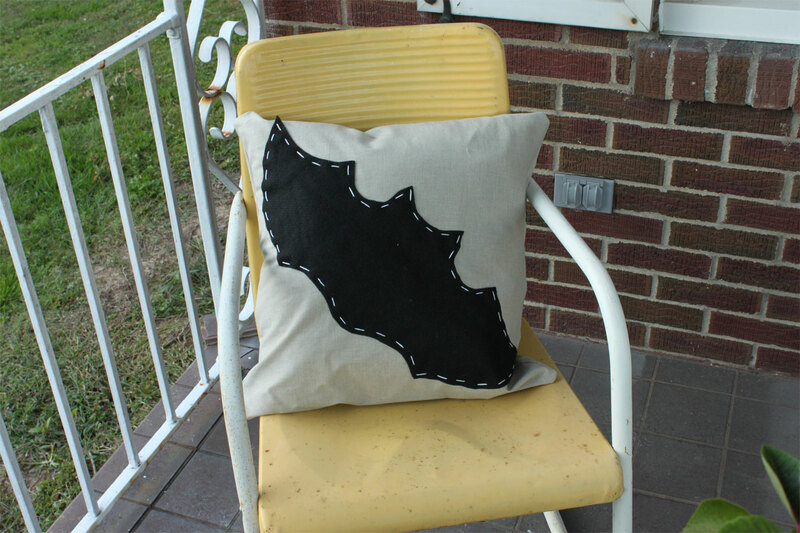 I started it Saturday morning and gifted it Sunday afternoon! I didn’t have time to block it, but I’m hoping that on an active six-year-old no one will notice. 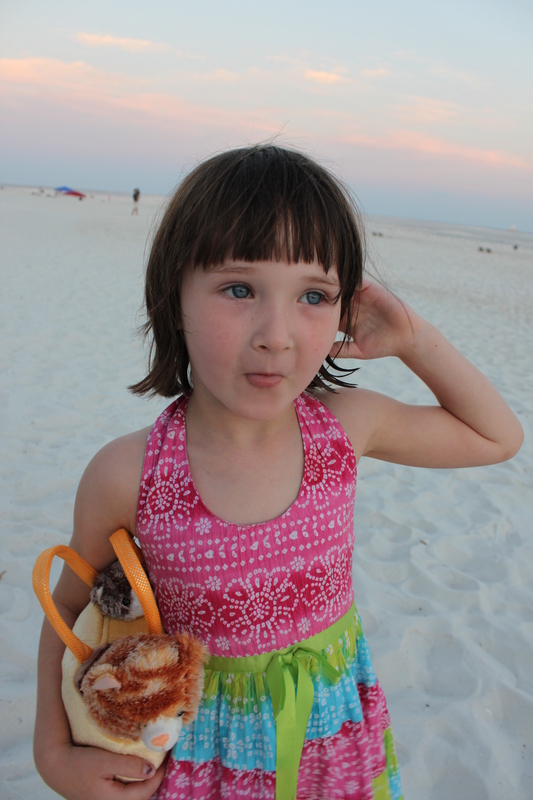 So I think I mentioned that I took quite a handful (ahem…825) of photographs on our recent vacation. I finally combed through them today and picked the hundred or so best for a Blurb book I’m hoping to make before a coupon expires. I wanted to share just a few favorites on my blog, but excess seems to be the name of the game for me and vacation photos. I narrowed it down to twenty-three I simply had to share. The first two go together. 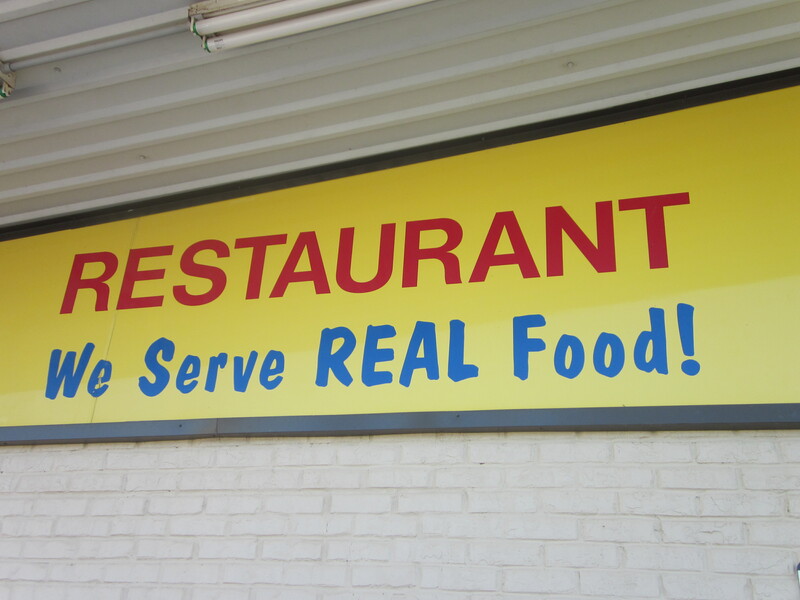 “Real food,” southern-style, at a truck stop in Alabama. 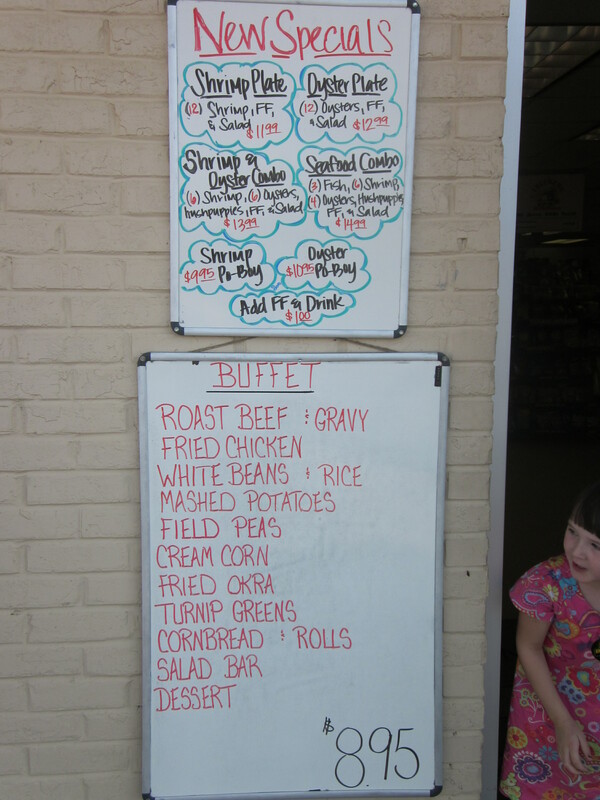 Wouldn’t mistake that menu for one from a Yankee state, would you? 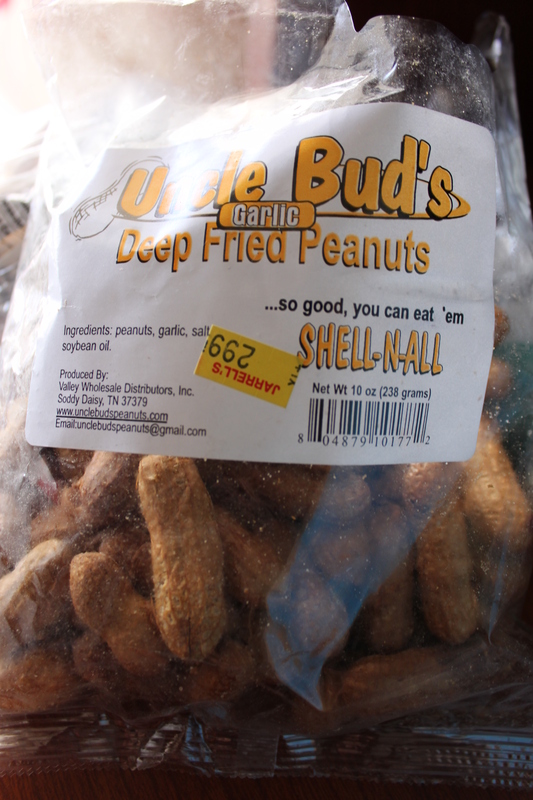 Although we’d already eaten lunch we had to try something from a place with so much local flavor, so we came away with these deep fried peanuts, which the package informed us to eat “shell-nall.” Well, we did. Dorothy declared them nasty, Worth spit his out. Rob seemed rather neutral. I loved them! Ate the whole bag over the course of the vacation. I thought they tasted rather like high-fiber peanut-butter filled pretzels. Yum. 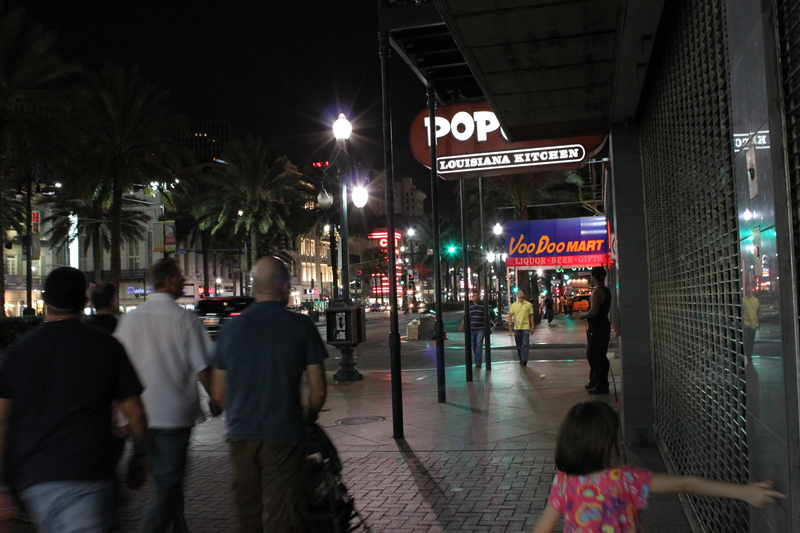 This photo was taken walking down Canal Street on our first night in New Orleans. All the lights and craziness had us mesmerized after our long drive, and Dorothy couldn’t keep her little germ-magnet hands from exploring the city along with her eyes. Bourbon Street revelers threw beads to Dorothy from a balcony and she scrambled all over the ground scooping them up with joy, having no knowledge of the racier version of that tradition. A panhandler told her she was the most beautiful girl he’d ever seen and she believed him completely and glowed with pride. Worth was given a little freedom to explore out of the stroller with the help of our monkey backpack, which is a contraption that would have horrified me before I became a parent myself. Now I figure it’s not a child leash because I’m not yanking on it; it’s saving my kid both from screaming and from being struck by traffic. Worth buys into the idea that it’s just a cute toy that allows him to walk just like his sister, without the indignity of holding Mom’s hand. 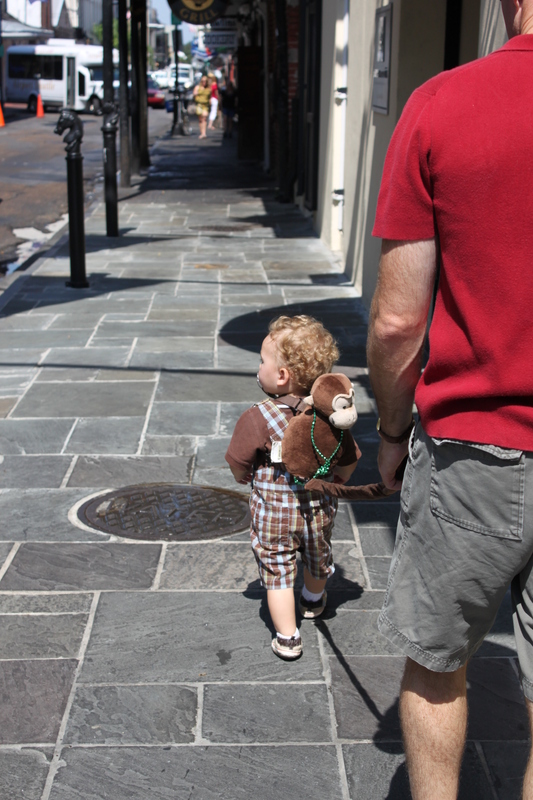 We stuck beads on the monkey for fun and got laughs all over the French Quarter. 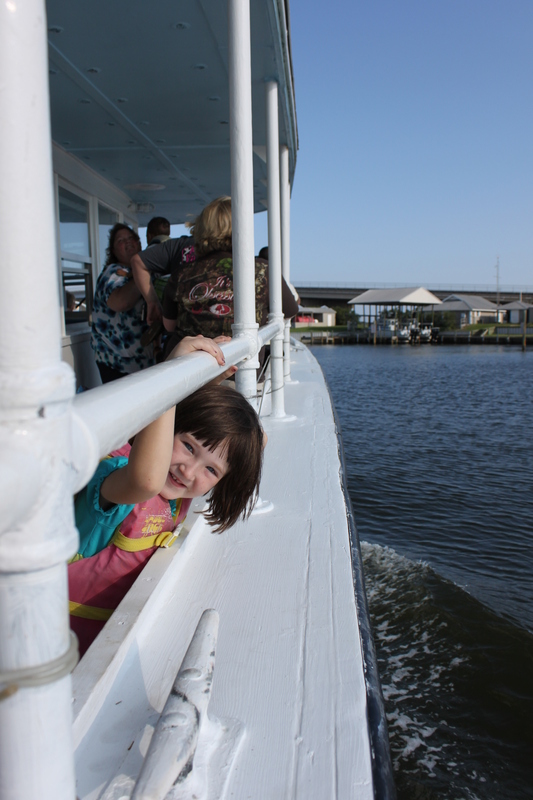 Each of my family members took in New Orleans in his or her own way. Worth looked for sticky things to touch. Rob and I looked at architecture and sweets. Dorothy looked for ways to spend her souvenir money. 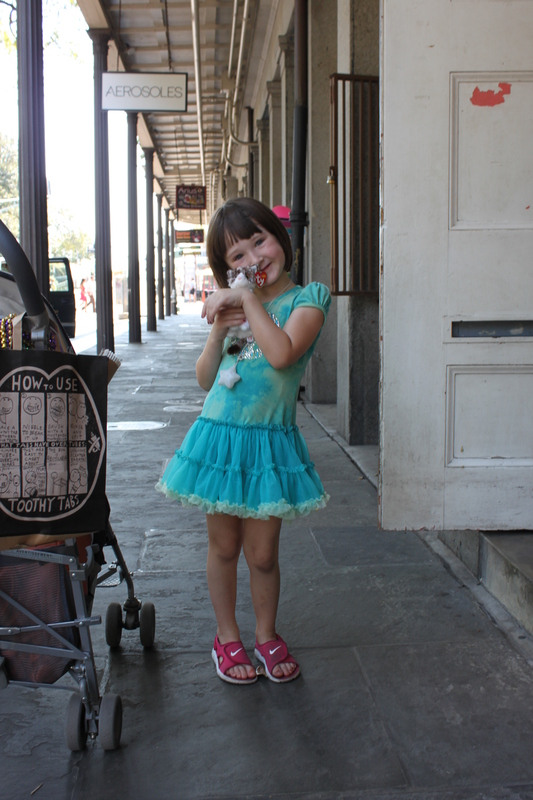 She found a small plush cat at an expensive little doll shop on Jackson Square and it became her constant companion for the rest of the trip. 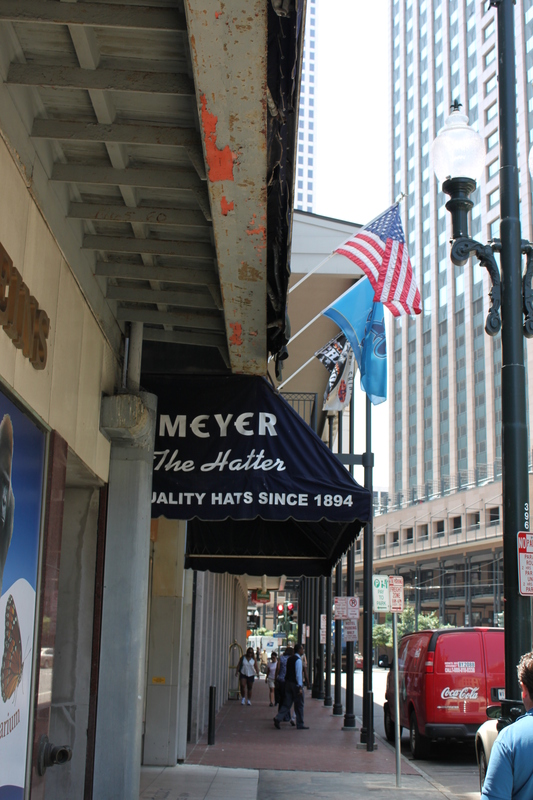 Rob became the happy owner of a new Stetson at the awesomely old-school Meyer the Hatter. He used to be a regular at the store when he traveled to New Orleans for business. Now their hat selection was one of the things that drew us back as family vacationers. 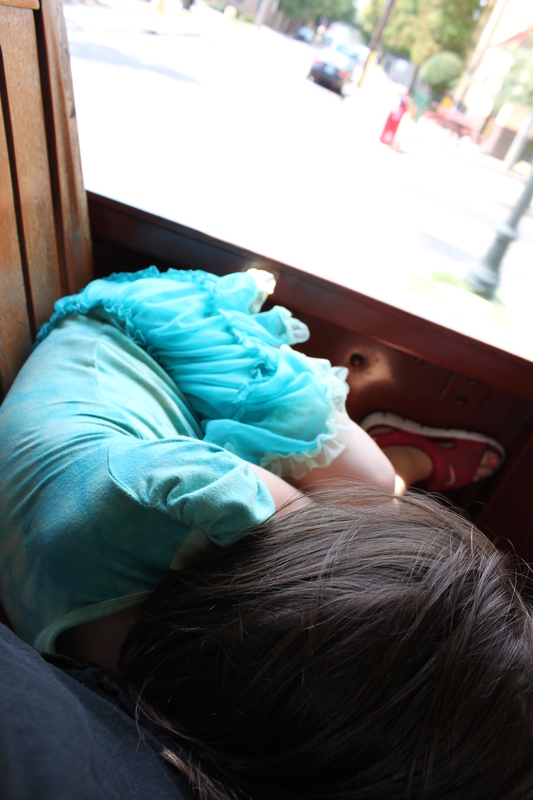 Dorothy and I took the street car through the Garden District and out to the end of the line and back, just like the character Jenny the Giraffe in a book we’d read before our trip. I loved how the book had prepared her to enjoy the ride. She was thrilled when we passed the same landmarks Jenny had introduced us to, and she enjoyed herself more just by having some context for the experience. 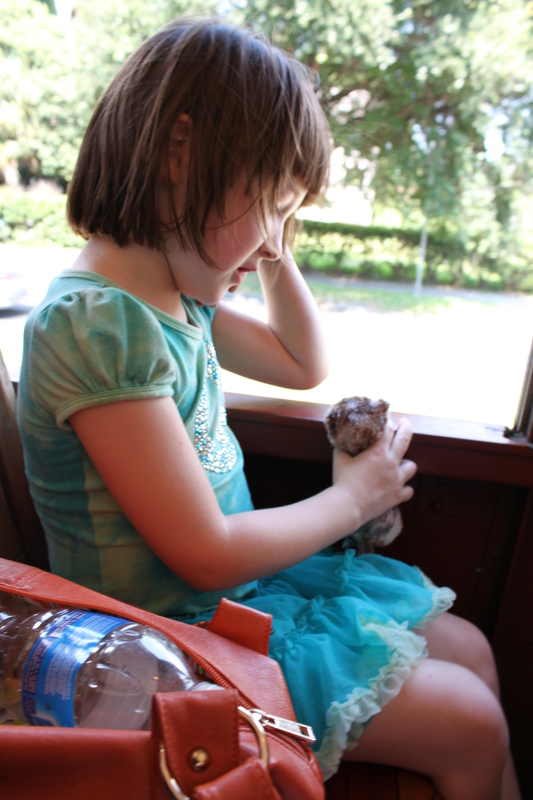 Her kitty seemed to enjoy the ride too. After so much excitement, however, Dorothy pooped out halfway through the return trip. I thought it was sweet that my fiercely independent girl could still nap with her head on Mom’s lap. 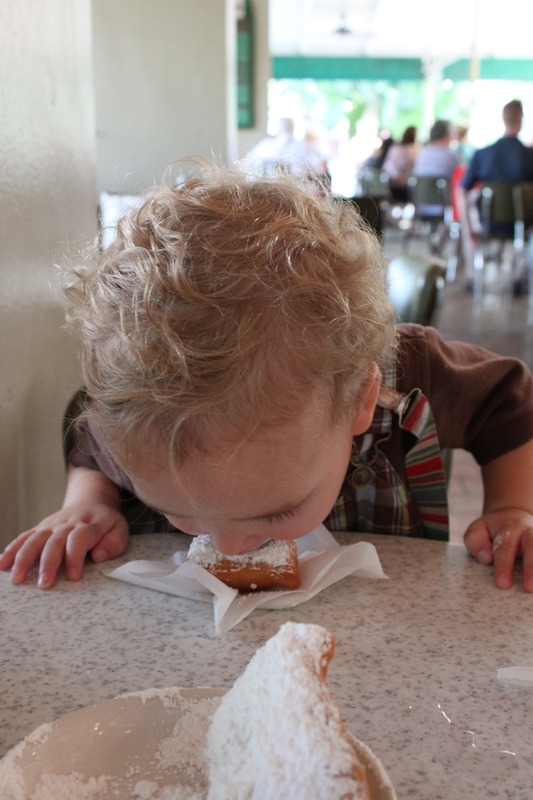 Sleep was nowhere near Worth’s mind when we seated him in front of beignets at the Cafe du Monde. I’d made beignets from a mix earlier in the summer to get us excited for our trip, but they were definitely not like the real thing. Worth looked at the powdered sugar and just dug right in, face-first. 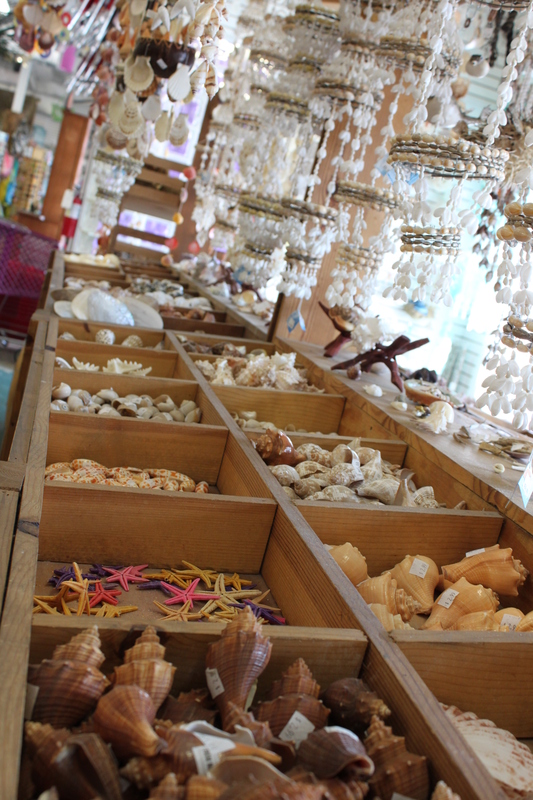 There is something that brings out the kid in everyone at these little sea-side gift shops. Worth and Dorothy still had money to burn (thank you grandparents!) during the second leg of our trip, and we were all happy to hit some beachy souvenir shops when we arrived at our next destination a little too early for hotel check-in. The campy charm of the gift shops is a little timeless, I think. Other than the slogans on the shirts, have they really changed much since my childhood, or that of my own parents? 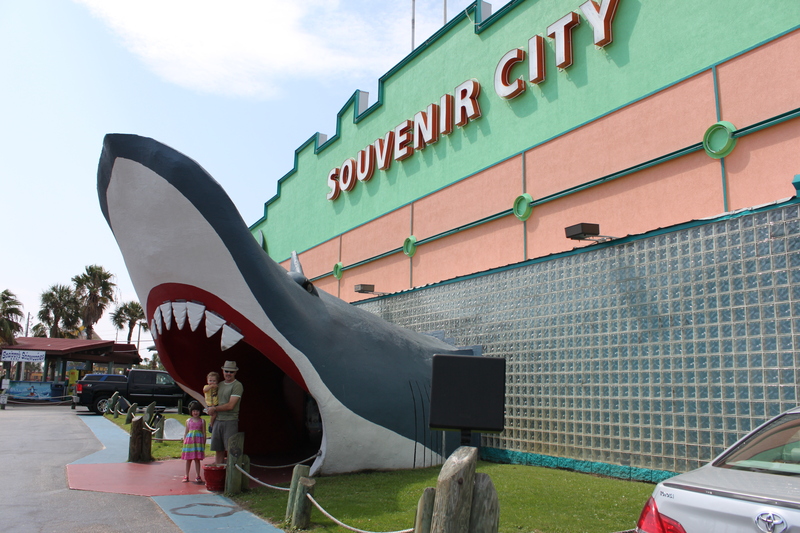 We loved the shark entrance of this one in Gulf Shores. Worth took to the beach immediately. 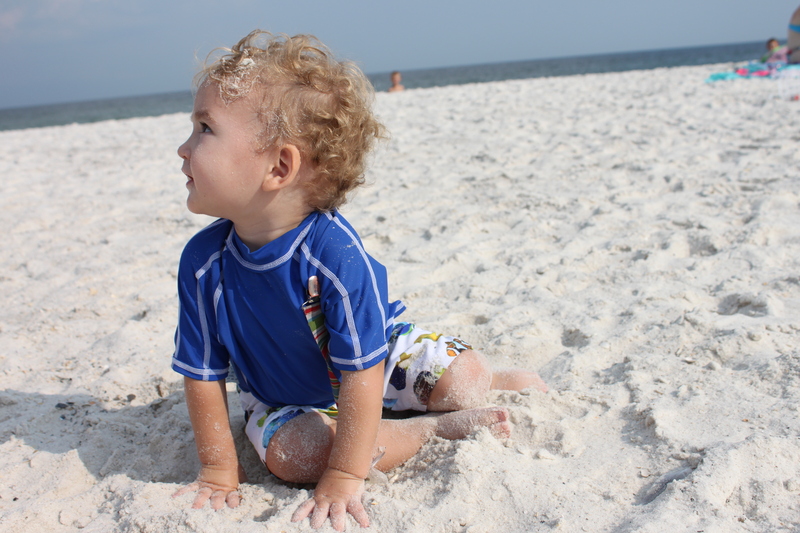 I’d expected some hesitation about the sand or the waves, but my boy was full of fearless joy the the whole time. He met the waves head on; he ate sand. I hope the size of this picture shows the detail that made me include it. 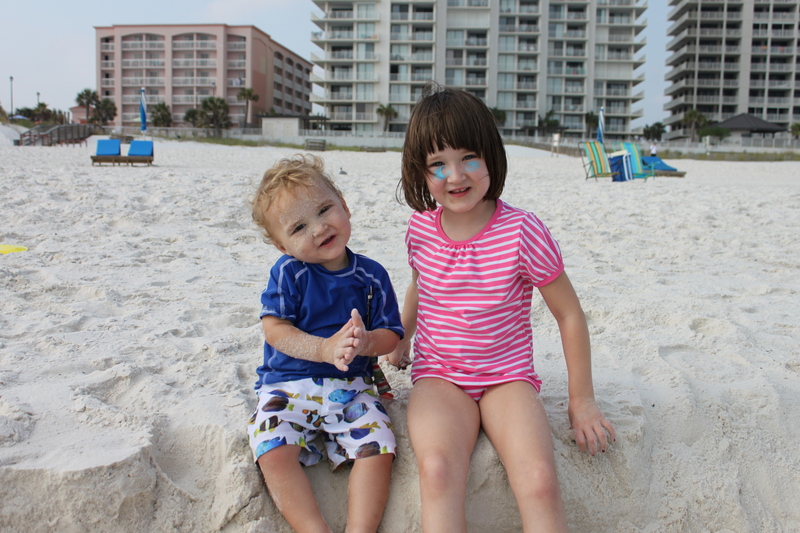 Worth’s face is covered in sand. Dorothy immediately made new friends each time we went out to the beach. If she couldn’t remember their names she’d just boss them around by saying, “friend! take this,” etc. 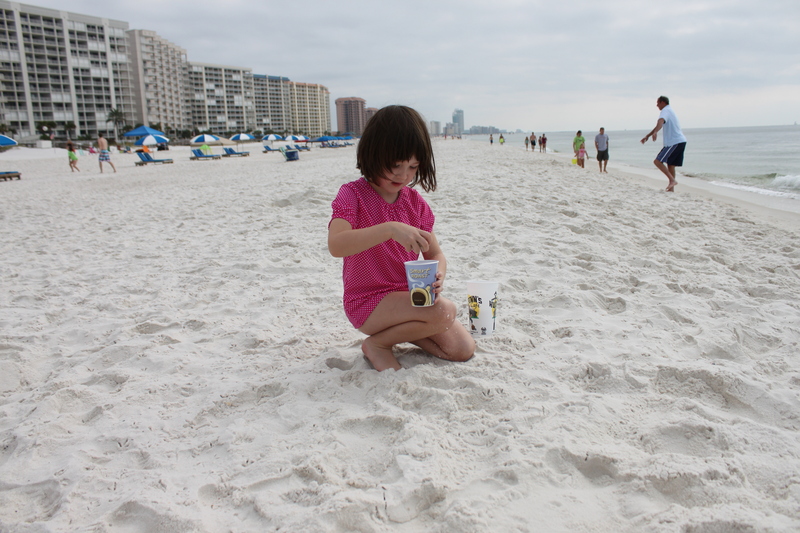 She played age-old beach games with children from Alabama, Tennessee and Louisiana while her father and I chased our sand-eating son. 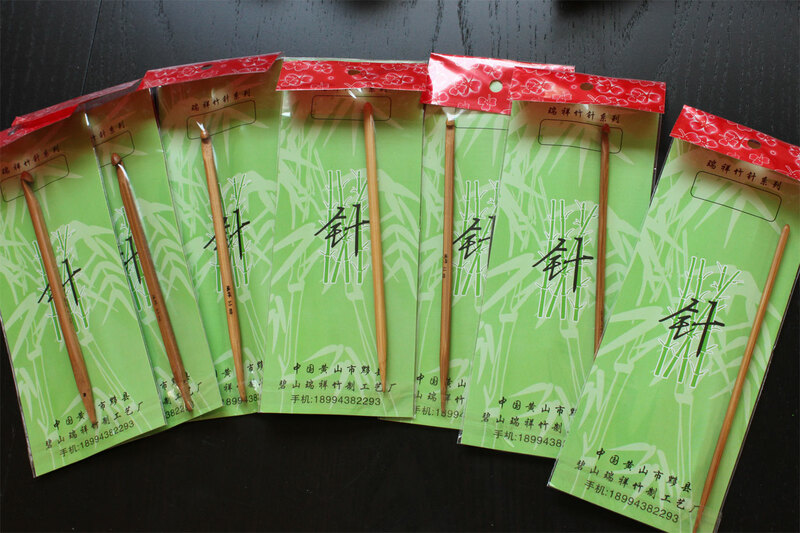 I was a little unsure about how to spend Worth’s souvenir money. Although he doesn’t talk much he has a way of making his opinions known, but he hadn’t seemed to develop any real opinions about gift shop items until we found Gawk on Orange Beach. Worth offered Gawk the pacifier out of his own sandy little mouth right there in the gift shop, so I knew we had to take that parrot home. 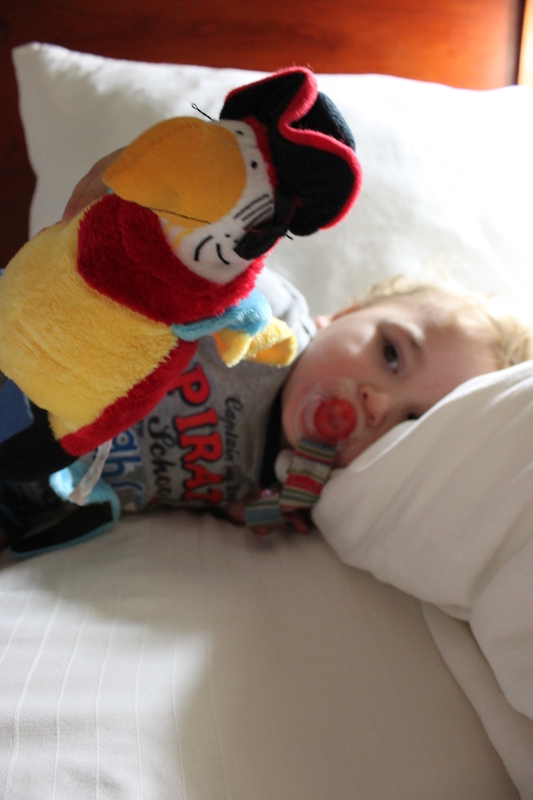 Sweetly, boy and parrot snuggled in the hotel bed. 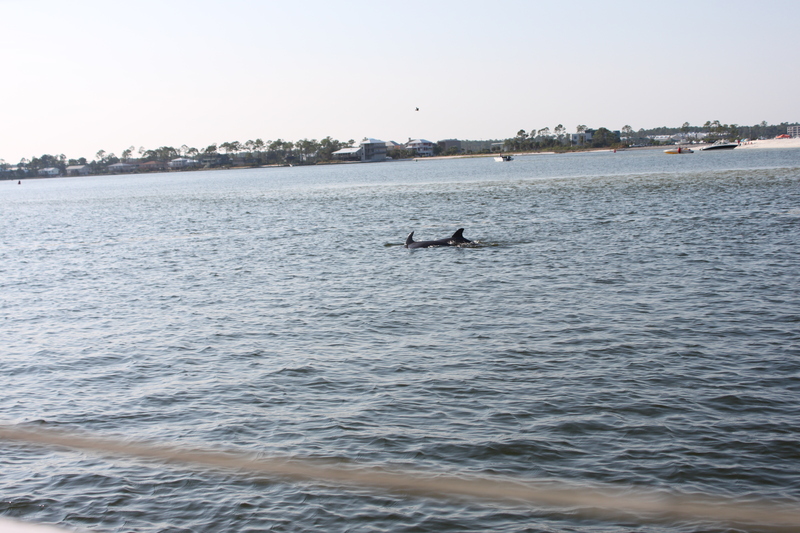 One afternoon we took a dolphin cruise. Rob and I were impressed with the number of dolphins we saw (many), and the kids were really impressed that I bought them chips from the boat’s snack bar. Vacation, baby! Me with my chip- and sand-filled boy. We took the children to an old fashioned mini golf course. There were plaster mermaids, tiki gods, all the good stuff. 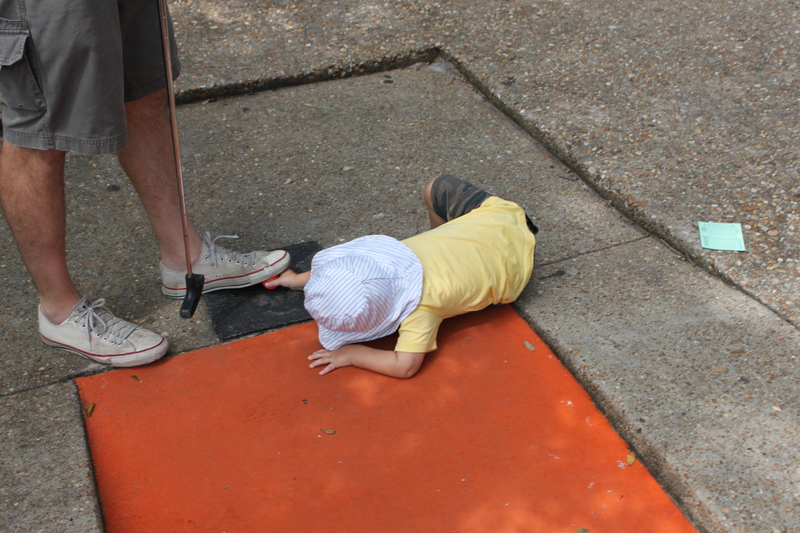 It turns out, however, that our little family may not be quite ready for mini golf yet. Worth wanted to throw the balls (see him here, trying to pry Rob’s out from under his foot) and Dorothy had no interest in playing a game she was unlikely to win. Oh well–now we know. 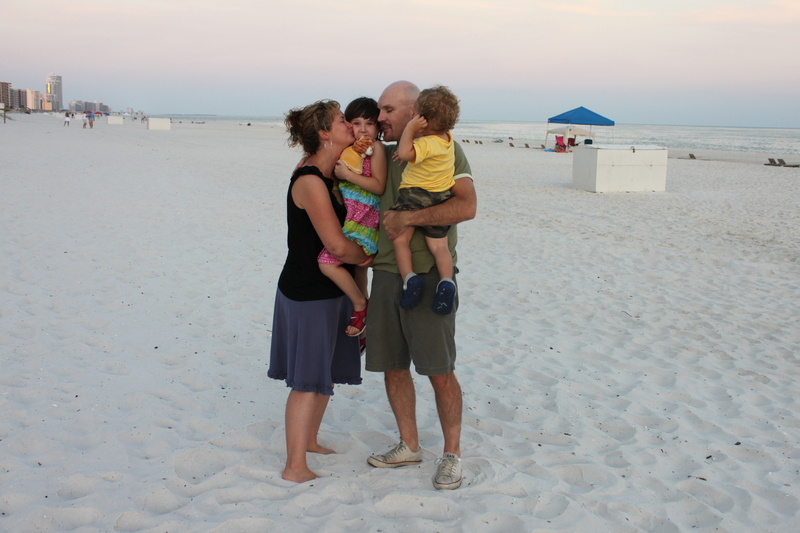 My family patiently displayed on-cue affection in front of my tripod on our last night on the beach. We have a photo of Rob and I kissing Dorothy on another beach when she was Worth’s age, and I wanted to recreate that photo with the four of us. 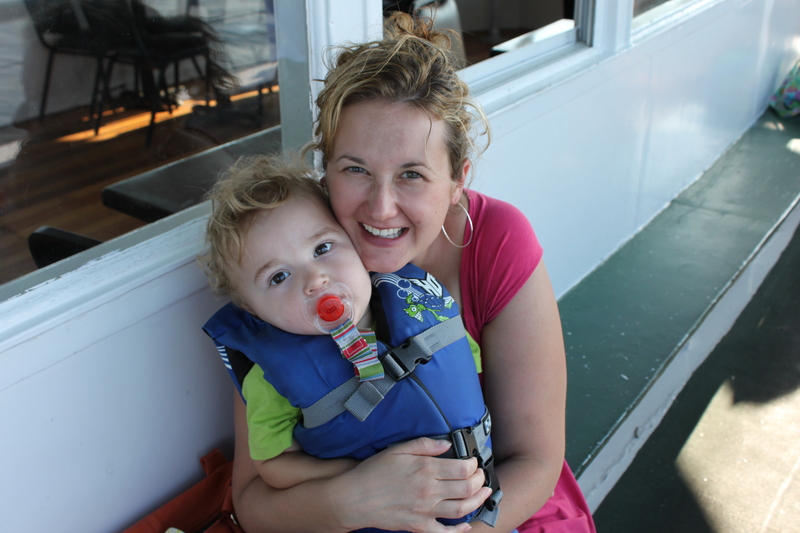 My sweet family, on record! Dorothy used the last of her spending money to buy (drum roll, please) another small plush cat, this time with matching plush carrying case. Amusingly, the two cats and their purse still seem high in the toy play rotation at home, even several weeks out. I guess she knew what she wanted. How silly of me to think that souvenirs should say something about the place they came from–these kitties say something about my little traveler! 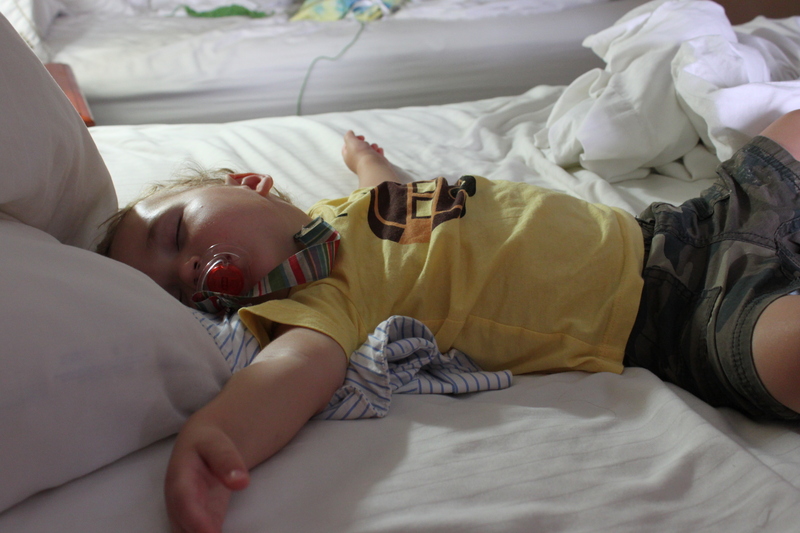 And a tired-out boy, sun-kissed, sand-filled and still fully dressed. These are the memories I want to keep! 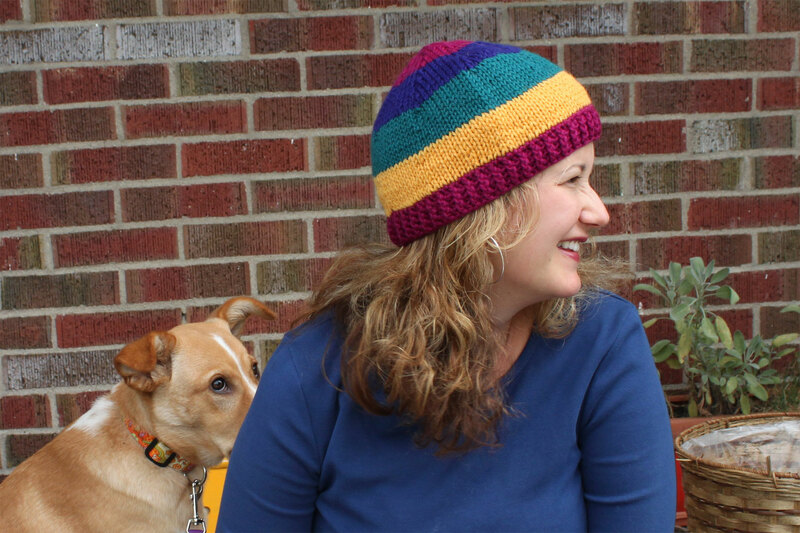 My dog is clearly jealous of my hat, don’t you think? This latest knooking project almost met a sad fate but I rescued it. I was doing some online shopping and came across this hat, which I felt like I needed, but in brighter colors. So I got some yarn (for less than $28!) and picked this pattern, which is similar to the Boden hat but has an awesome little button tab. I knooked the ribbed section in a cranberry color, more red than the purplish shade of the ribbing in my photo. The end result, unfortunately, looked awful. Somehow my ribbing was of a larger gauge than the rest of the hat (I think I should have gone down a needle size after the ribbing, although the pattern doesn’t require it) and the color, which had looked rainbowy and fun next to the other colors in my knit bag just looked weird and clashy on the hat itself. The hat also turned out just a wee bit too tall, which is sometimes a problem with me and hats because I have a small head. I hated to trash the project but I really didn’t like it, so I decided to snip off the ribbed section and knit it again in the purplish color with a smaller hook. I snipped, but then I realized that the knitting would a) be going the wrong direction and b) that I don’t yet own a smaller hook. Oops. 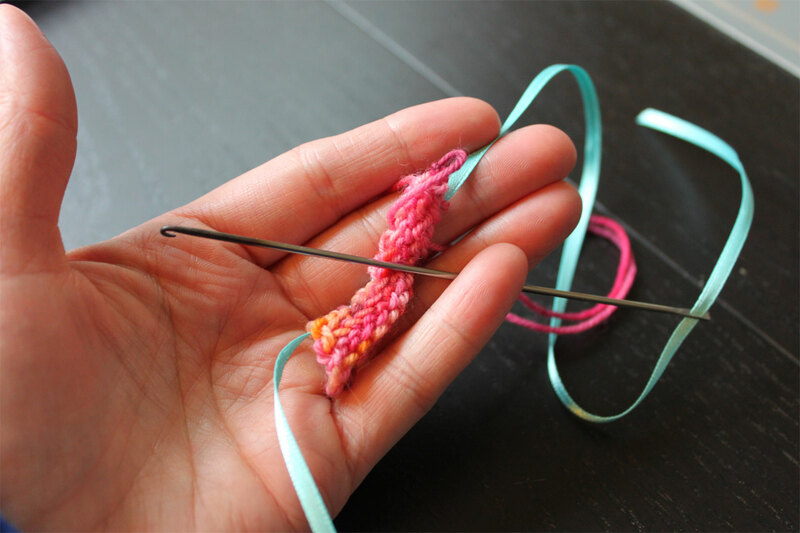 And unlike crochet, when you’ve snipped off a section of knitting you have a project with all these little loose loops that want to be sucked up into your project–you can’t just knit right onto them like you can in crochet. So my solution ended up being just to crochet the ribbed section. I didn’t bother with the little button tab section again, but I did grab a smaller crochet hook and slip stitch into each loose loop all around, then made ribbing by alternating front-post double crochets and back-post double crochets into a row of double crochets. Three rounds of the front and back-post stitches made a nice ribbed section and I was able to make it smaller than the first, thus also solving the problem of the hat being a bit big. In non-crafty news, being a member of my household this week is a bit rough. My husband ruptured his Achilles tendon playing basketball and all craftiness (and fall camping, alas) is on hold until he gets surgery next week and moves on with his recovery. Having their usually-active father on crutches is hard on my kids and don’t get me started on how much fun it is to be the sole partner in charge of toddler-chasing, garbage duty, kitty-litter cleaning, laundry, and pretty much everything else requiring feet. While rescuing knitting projects is within my realm of competency, stepping in to take on my husband’s household duties while remaining reasonably cheerful and living with a high-energy wounded attorney on crutches is really not. The baby is reacting to our household chaos by refusing to sleep (so helpful! ), the dog is vomiting, my daughter bursts into tears at every opportunity, and I’m doing things like leaving yeast (a very essential ingredient!) out of bread dough. Fortunately, our collective sense of humor is intact and we’re pretty good at stepping back to see our problems as transient and still small compared to some of the issues other families face all the time. And we have a well-stocked liquor cabinet, which really helps the grown-ups.